NOTE: This course is aimed at the hobbyist upholsterer - it is not suitable for those seeking a career in upholstery. Thank you for taking an interest in my upholstery classes. I have worked in the upholstery trade for over 30 years. Price Brothers was established in 1946 by my Grandfather and his brother. Over the years I have been blessed with schooling second to none. Learning from both my Father and Grandfather, I hope to make your experience special and rewarding by introducing you to some of the traditional skills passed down to me through three generations of family upholsterers. My classes will teach traditional upholstery skills and techniques in a relaxed and friendly environment. Complete beginners are welcome, as are those with some previous experience in upholstery. Informal, friendly & fun! 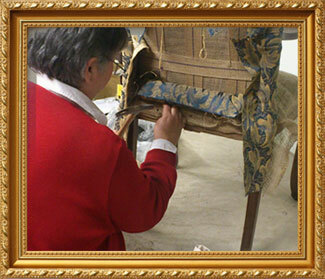 All the basic skills of upholstery can be covered for traditional or modern furniture. You will be taught each technique, from stripping down, re-padding, to fitting the cover. No prior experience is required for this course, just enthusiasm and a love of craft. Please bring your own project to the class. Choose something fairly easy if this is your first attempt. e.g. small stool, nursing chair, drop in seat, headboard or dining chair. I can provide small antique dining chairs for you if required. Why not make a new stool! Or you may pick up a bargain at a sale room. Not sure? please get in touch. Note: this is not a sewing course-any machining would be completed outside of the class. This can be arranged with our workshop but is chargeable. Either bring your own, share what we have available or purchase special upholstery tools from me. At the very least you’ll need - small tack hammer, sharp scissors, tape measure, pliers/pinchers for staple/tack removal & wooden mallet. We do stock most upholstery items & have a good selection of fabric roll ends. Any fillings or sundries used during a class are extra and chargeable at special discounted prices to students. Simply complete the below form, we will call you back to discuss available dates and times. (We aim to get back to you by the next working day). Due to the nature of the course I will be required to use hand tools capable of causing injury, I understand this is at my own risk and neither Price Brothers or Sean Price will be liable for any injuries. I understand that all personal possessions, furniture, tools & materials brought onto the premises are there at my own risk. I agree to follow all health and safety instructions, to wear suitable clothing & hard footwear. To keep my work areas clear and safe and report any problems to the tutor immediately. I will only use tools (both hand and machine) after receiving instruction from the tutor. I understand that working with furniture will involve moving, lifting, carrying (upstairs) and I confirm that the piece I bring to work on is suitable for my degree of physical strength and fitness. Price Brothers / Sean Price will not be liable for any work carried out during the classes. I will inform tutors of any special needs or requirements before the course commences. Course fees are payable in advance at the time of booking, I will be refunded if I cancel up to 5 weeks prior to the start of the course or if an alternative student is found to fill the empty space.